Chippewa blueberries (Vaccinium "Chippewa") are cold-hardy, producing mid-season, sweet and large light blue berries. They are a half-high species, as opposed to high-bush or low-bush varieties, and grow about 3 feet tall and wide. They can live as long as 20 years and produce 3 to 8 pounds of berries per bush. "Chippewa" blueberries grow best in U.S. Department of Agriculture plant hardiness zones 3 through 8. Although they can grow in a number of locations, they are particularly suited to the cold weather and grow well in northern states like Maine and Minnesota where other species fall to extremely cold winters. They require 800 to 1,000 hours of chilling time, the time spent below 45 degrees Fahrenheit during the winter, to set fruit in the spring. Plant them in locations with full sun for the best output. Blueberries do not tolerate standing water and will fail to set fruit if they are too damp, so plant in areas with adequate drainage. Like all blueberries, "Chippewa" prefer acidic soils high in organic material. The ideal pH is 4.8 to 5.2. Add 4 to 6 inches of peat moss into the planting hole, as suggested by the University of Minnesota Extension, and till it into the first 8 inches of soil before planting. This not only adds the much-needed organic material, but also increases acidity. Plant bushes 3 to 4 feet apart and cover the root area with 2 to 4 inches of pine mulch to further acidify the soil. "Chippewa" is a self-fertile blueberry, but like most self-fertile plants it performs best when with a pollination partner. "Northsky" (Vaccinium x "Northsky") is an excellent choice which is cold hardy in USDA zones 3 to 7. It is also a mid-season, half-high blueberry. The berries are sweet and sky-blue colored. For the most effective cross-pollination, plant the different varieties in the same row or in a row adjacent to one another. Bees and other helpful insects need to carry the pollen from one bush to another, so although some pollination can occur up to 100 feet away, keeping them close is most effective. Fertilization can help new plants to establish and keep older plants growing effectively. It is possible to have too much of a good thing, and over-fertilization can kill blueberries. On newly planted "Chippewa," use 1 ounce of a granular 16-8-8 fertilizer on each plant. In early spring before foliage appears, spread the fertilizer evenly around the drip line of the bush, avoiding the blueberry stems. Gently fold the grains into the soil and water the area lightly to lock the materials into place. On older, established plants, use up to 5 ounces of fertilizer per plant. 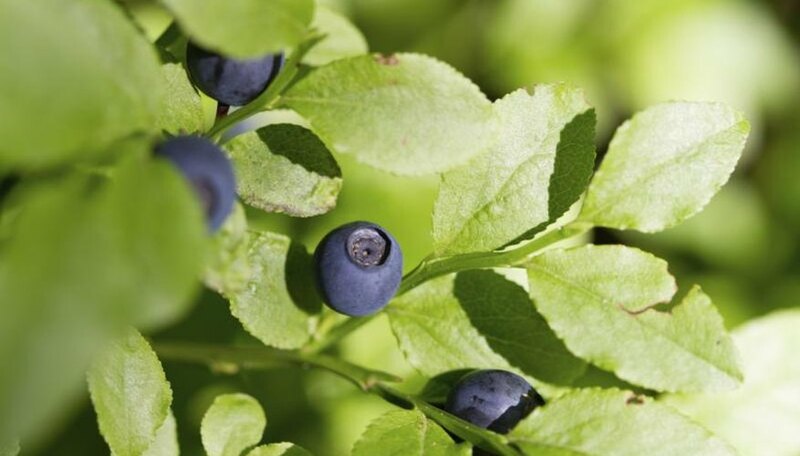 Blueberries flourish in moist, but well-drained soil. During the growing season, water each plant with 5 gallons of water per week. Increase to up to 20 gallons a week during ripening, particularly if there has not been rain, keeping the water even on all sides of the plant.